In this article, I am going to explain how to create a basic web application using ASP.Net Core MVC and Visual Studio Code in Windows System. In this article, I am going to explain how to create a basic web application using ASP.NET Core MVC and Visual Studio Code in a Windows system. We are going to create a sample Employee Records Management System. We will be using ASP.NET Core 2.0, Entity Framework, and SQLite. Now, we are ready to proceed with creation of our first web app. Press Window+R. It will open the "Run" window. Type ‘cmd’ and press ‘OK’. 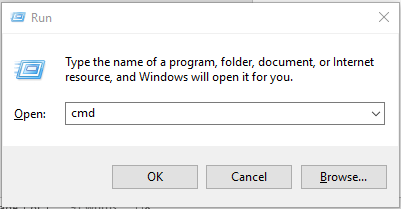 It will open the command prompt in your system. Type the following commands. 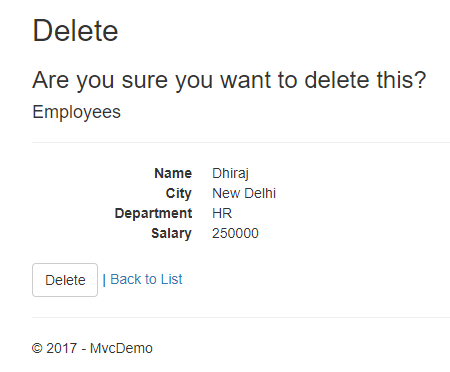 It will create our MVC application “MvcDemo”. 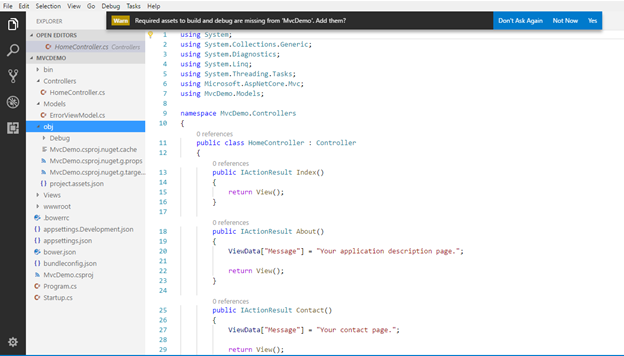 Open this “MvcDemo” application using Visual Studio Code. If it prompts the message "Required assets to build and debug are missing from 'MvcDemo'. Add them? ", select "Yes". Right click on Models folder and select a "New "file. Give it a name such as Employees.cs. It will create a file inside Models folder. Open Employees.cs file and paste the following code to create Employee class. Since we are adding the required validators to the fields of Employee class, so we need using System.ComponentModel.DataAnnotations at the top. Now, our data model class is created. We will create Views and Controllers using scaffolding. For scaffolding, we need to add NuGet package references in <ItemGroup> tag in MvcDemo.csproj file. Save the file and select "Restore" to the Info message "There are unresolved dependencies". 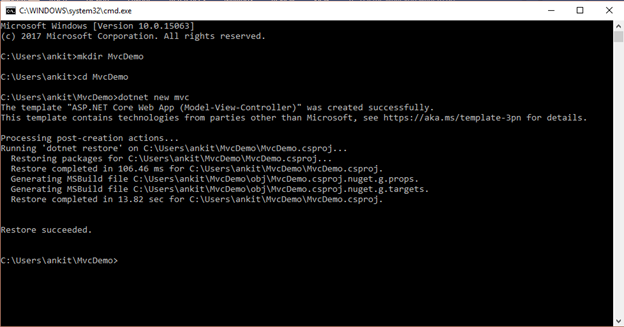 Now, your MvcDemo.csproj will look like this. The next step is to add MVCEmployeeContext.cs file in our Models folder. Open the file and add the following lines of code. Now, your MVCEmployeeContext.cs file looks like this. Now, open Startup.cs file and add following two using statements at the top. 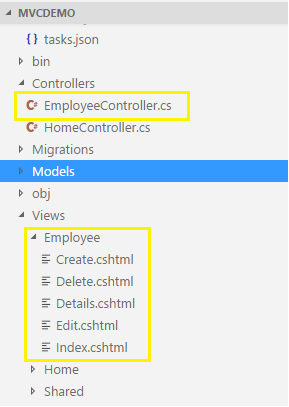 This line of code tells Entity Framework which model classes are included in the data model. 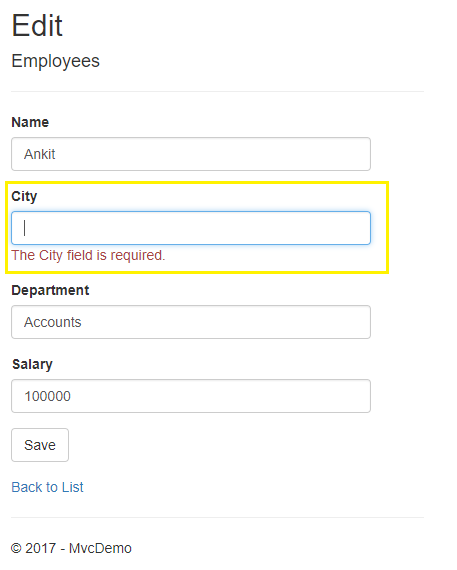 You're defining one entity set of Employee object, which will be represented in the database as an Employee table. Now, we are going to Scaffold the controller and Razor view files. 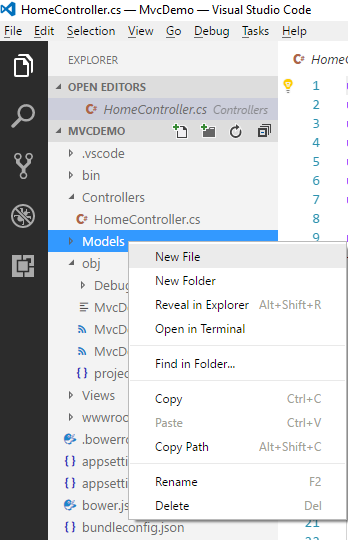 Navigate to MvcDemo project folder in your system. 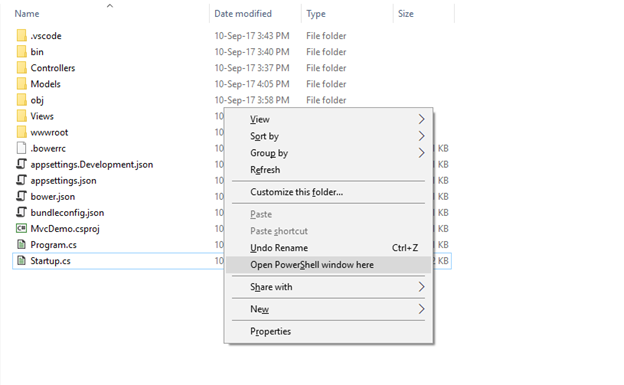 Press and hold Shift and right click, it will give you the option to “open PowerShell window here “as shown in image below. Click and it will open a PowerShell window. 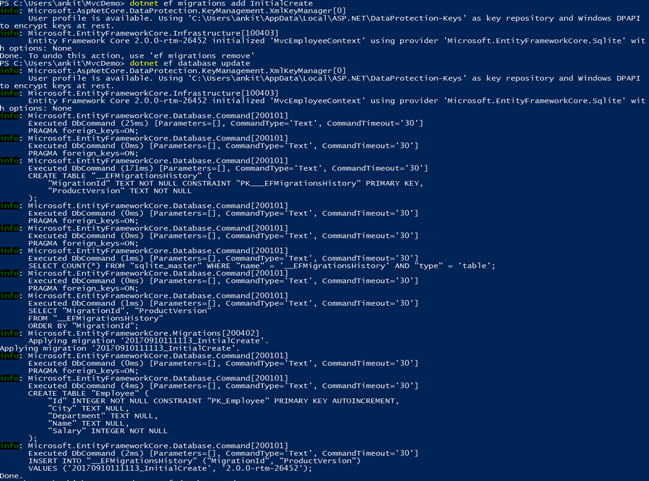 Run the following commands in PowerShell console. This process of automatically creating CRUD(Create, Read, Update, Delete) action methods and views is known as scaffolding. Open PowerShell in Project folder again. The “dotnet ef migrations add InitialCreate” command generates code to create the initial database schema. The schema is based on the model specified in the DbContext (In the Models/MVCEmployeeContext.cs file). After running the second command you will get a message at end "Done". And that’s it. 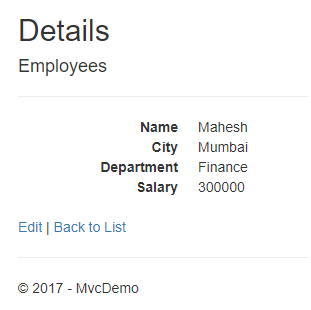 We have created our first ASP.Net Core MVC application. You can see the page shown below. Click on CreateNew to create a new Employee record. Add a new Employee record as shown in image below. 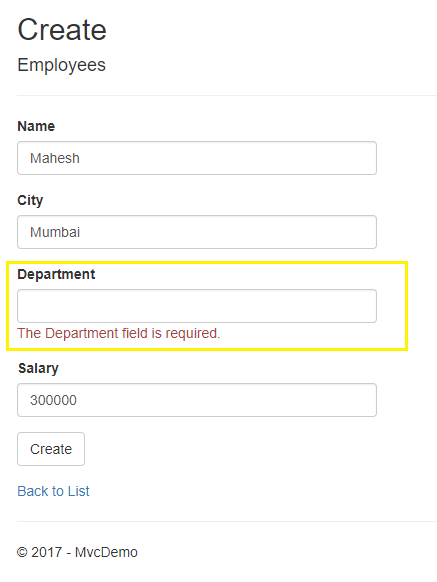 If we miss data in any fields while creating employee record, we will get a required field validation message. After you click on Create button in "Create View", it will redirect to Index View where we can see all the employees added by us. Here, we can also see action methods Edit, Details and Delete. If we want to edit an existing employee record, then click Edit action link. It will open Edit View as below where we can change the employee data. Here we have changed the Salary of employee with name Dhiraj from 200000 to 250000. Click on Save to return to Index view to see the updated changes as highlighted in image below. If we miss any fields while editing employee records, then edit view will also throw required field validation error message. If you want to see the details of any Employee, then click on Details action link, which will open the Details view as shown in image below. 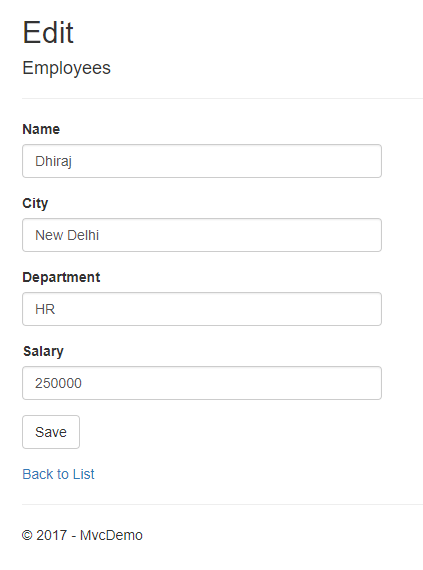 Click on Back to List to go back to Index view.Now we will perform Delete operation on Employee with name Dhiraj.Click on Delete action link which will open Delete view asking for a confirmation to delete the employee. Once we click on Delete button the employee record gets deleted and we will be redirected to Index view. Here we can see that the employee with name Dhiraj has been removed from our record. 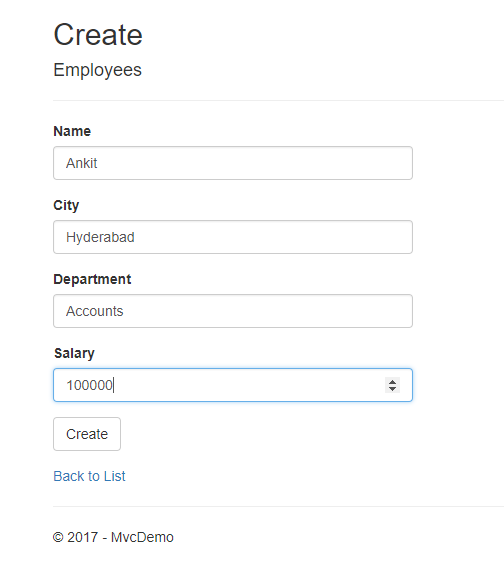 Open EmployeeController.cs and scroll down to Delete method. You can observe that we have two Delete method, one each for HTTP Get and HTTP Post. We have learned about creating a sample web application using ASP.Net Core MVC and perform CRUD operations on it. We have used Entity Framework and SQLite for our Demo. Please refer to attached code for better understanding.